Graves Motorsports Yamaha R6 Titanium EleckTricK bLUE sleeve with stainless link pipe Slip-On exhaust. Graves Motorsports hand-made in the USA Titanium EleckTricK bLUE slip-on Silencer for the 06-19 R6. This slip-on exhaust is new from the ground up with record breaking race developed features. Graves' precise engineering develops precision products that are designed to outlook, outperform and outlast the competition. This product is intended for closed course competition use only. Scroll down for sound and installation videos. NOTE CUSTOM BUILD 10-14 DAYS TURN AROUND - CALL 1-800-867-6480 Ext. 800 to verify build and purchase! Thank you. New Silencer Design Featuring: Titanium EleckTricK bLUE Sleeve with Titanium EleckTricK bLUE End Cap and stainless steel exhaust tubing. This is a electronic ano process that takes a titanium parts and electro coats the parts over a 48 hour process. This is not cheap metal with pretty paint! Strapless can design mounts without the use of strap bands around the silencer by using a top mounted bracket that's structurally integrated. This design not only streamlines looks of your bike and saves weight. Dyno charts shown are with the Graves specific mapping and FTEcu ecu tuning kit, together these eliminate error codes and produce a solid 5-6 horsepower / 5-6 torque increases all while making your R6's power delivery smoother! Graves Slip-on Ti = 2.2 lbs. (-1 lbs.) Stock Muffler = 3.2 lbs. 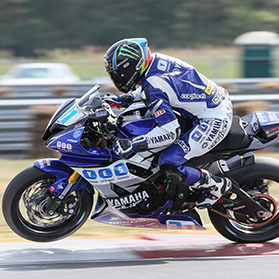 Sound File of the Graves Motorsports Slip-on Exhaust for the 2006-2017 Yamaha R6. This slip-on retains the stock cat system and removes the exup valve. When installed and used with the Graves FTEcu flash on the 2017 unit will gain 5-6 horsepower and enhance the ride-ability overall.